As Osun West senatorial by-election draws nearer, the Osun State chapter of the People's Democratic Party (PDP), on Tuesday raised an alarm over alleged plans by the ruling All Progress Congress (APC) in the state to scuttle the process and prevent free, fair and credible poll on July 8. PDP also alleged that some electoral officers have connived with the APC chieftains to disenfranchise some voters identified as supporters of PDP by allegedly deleting their names from the list of eligible voters. Chairman of the party, Hon. 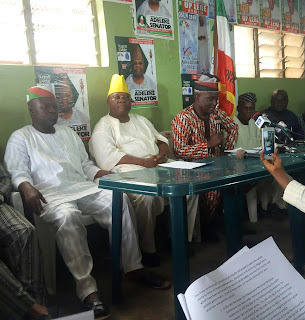 Soji Adagunodo, made these revelations while addressing a press conference at the party's Secretariat in Osogbo. Adagunodo further alleged that the APC had concluded plan to distort the allocation of ballot papers in such a manner that would ensure those meant for specific local governments, wards and polling units are diverted to wrong locations; so as to delay the commencement of voting and to void the election in such places. Adagunodo who frowned at the desperate conduct of some chieftains of APC said the ruling party under the leadership of Gov. Rauf Aregbesola has allegedly "procured the service of notorious thugs from within and outside the state, to unleash violence in Ede North, Ede south, Egbedore, Irewole, Iwo and Ayedaade local governments on election day." "The APC election strategy committee is conniving with certain elements in INEC to recruit OYES cadets and other party sympathisers as presiding officers and polling clerks. Part of the plans is to sew fake NYSC uniform and distribute same to these elements in order to make them carry out this noferious plan. "There are plans by the APC to ensure that INEC allocate non-functioning card readers to areas considered as stronghold of PDP. This, in their thinking, according to Adagunodo, would slow down accreditation of voters and get voters discouraged. In his words: "we have credible information about the plans of APC and the state government to arrange the kidnap and or arrest of leaders of the PDP in certain local governments on the eve of July 8. "As we speak, certain chieftains of APC have compiled names of their party members and sympathisers to be accredited by INEC as election observers and monitors. "You will recall 181 of these same elements from Osun State were arrested somewhere in Imo State in 2013, while traveling as fake observers for the Anambra governorship election. The PDP Chair further alleged that the APC flagbearer, Senator Mudashir Hussein plans to transport thousands of non-residents fake voters from Abidjan, Cotonou, Togo and Ghana begining from this week. The fake voters according to Adagunodo were to be camped in Ejigbo, Iwo and part of Egbedore local government. Nonetheless, he has assured party members and supporters in the ten local governments in the district that the National body would not fold its hands and allow anyone; no matter how highly placed to subvert the freewill of the electorates.